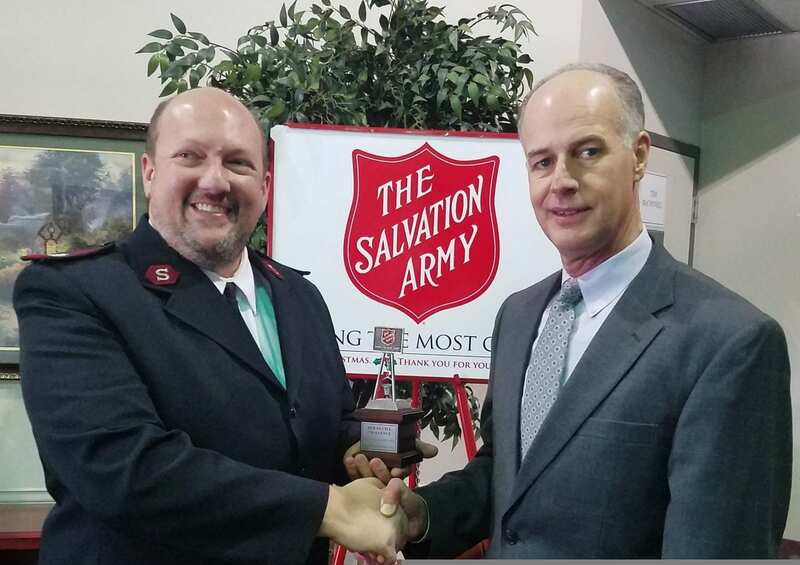 Majors Ray and Whitney Morton of The Salvation Army in Shreveport presented Bossier Sheriff Julian Whittington with the 2018 Red Kettle Challenge trophy at their headquarters Thursday afternoon. This was the third year for the Bossier Sheriff’s Office to compete against Caddo Parish Sheriff’s Office to ring the bell during Christmastime and raise funds for those in need in our community. Both Bossier and Caddo SO have raised $12,648 in the three years of friendly competition ($7,223 for Bossier and $5,425 for Caddo). While Bossier SO has bested Caddo all three years, the two agencies know it’s all for a good cause. On the one day of bell-ringing on Dec. 14, 2018, Bossier deputies and staff raised $1,864. The Majors also presented Dr. Lamar Goree, superintendent of Caddo Parish Schools, as the 2018 winner against Bossier Parish Schools.